Contains broccoli extracts, vitamins, aloe, camomile. It is water-resistant, suitable for people who does water sports. Camomile has calming effects, so it's also suitable for people with sensitive skin. Broccoli extract gets absorbed into the skin and creates enzymes which protect the skin from UV rays. It can reduce the chance of being sunburned and getting red spots. The chemical substance responsible for this protection prevents formation of tumours. Broccoli extract (acting as a protective shield) can also stay in your skin longer then regular sunscreen. 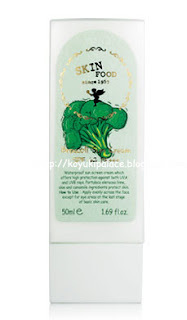 It doesn't wash away easily, after using it for a few days, although the broccoli extract is not physically on the skin any more, it can last for as long as 3 days!! That doesn't mean you can apply sunscreen once every few days, it just means your skin has a basic protection from the sun.